It is no secret that Nigerian youths are increasingly turning from street drugs to prescription drugs for recreation or to enhance academic performance. To curb the ugly trend, experts and stakeholders, especially the pharmaceutical Society of Nigeria have advocated for pharmacists to be given full control of drug distribution and use in the country. This way, pharmacists claim they would have increased vigilance over supply of medicines, either on prescription or over the counter to prevent it from ending up in the black market and being abused or misused. According to them, being in full control of medicines would also guarantee a strong drug safety and security programme which they say is the foundation of a robust national ethos for any country. In addition to this, pharmacists are demanding for a boost in local production of essential medicines and drug security in the country. Corroborating these views were Dr. Okey Akpa, Chairman, Pharmaceutical Manufacturers Group of the Manufacturers Association of Nigeria (PMG-MAN) and Mazi Sam Ohuabunwa, the newly elected President of the Pharmaceutical Society of Nigeria (PSN), at a press briefing on presidential inauguration of Ohuabunwa and fellowship investiture last Tuesday. Indeed, both tasked the Federal Government to involve pharmaceutical manufacturing sector in achieving drug security. 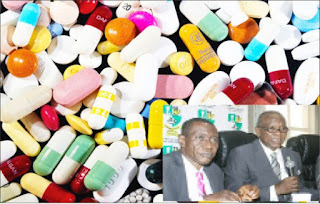 The duos who are renowned industrialist in the pharmacy industry called for increase in the country’s local production of essential drugs from the present 40 to 45 per cent to at least 70 per cent to guarantee drug security. They also asked the Federal Government to approve a N300 billion pharmaceutical manufacturers expansion fund that will ensure that stakeholders have enough funds to improve their facilities to meet the World Health Organisation’s (WHO) prequalification and standard. Akpa, the Chairman of the Inauguration and Investiture Committee of the PSN’s presidential inauguration event, scheduled for Thursday January 24, 2019 at the Transcorp Hilton, Abuja, said that the right incentives should be in place to achieve drug security. He said; “We have moved up to 40-45 percent, but we have deviated. As far back as 2005, we have said 60 percent of what we produce should meet 70 percent of what we consume and 40 exported. Akpa appreciated the efforts of the present government under the leadership of President Mohammed Buhari for some key policy interventions that have saved the industry. He noted that the common external tariff (CET) for Economic Community of West African States (ECOWAS) ECOWAS CET which was wrongly applied to the pharma sector was the most unfavourable policy against the pharma manufacturing industry. The PMG-MAN boss said a situation where finished pharmaceutical products were being imported into the country at a zero duty tariff, while manufacturing inputs attracted import duty tariffs ranging from five to 10 per cent and 25 per cent in some cases like hard shell gelatine capsule left manufacturers with no option other than to close the factories and face importation. The pharmacist said Nigeria must prioritise the local pharmaceutical manufacturing industry and treat it as strategic. “We say so because with a population of over 180 million people and growing at about three per cent, medicine security is must for Nigeria to achieve. “The industry apart from playing this key role of guaranteeing access to quality and affordable medicines on a sustainable basis offers one of the most robust value chain. “This brings with it huge employment opportunities, foreign exchange earning capacity, industrial and economic development. “We want the industry prioritised just like we have done for agriculture. Both are very closely related and deal with sustainable security of human lives. In doing so, Government should create a comprehensive incentive package targeted specifically at local pharma production. “This is where the N300 billion pharma Manufacturing Expansion and Export Fund comes in. We are canvassing for this fund to serve as a catalyst for growth in this industry. “Every priority industry needs some sort of protection. In this regard, local pharma must be protected to the extent that products that can and are being manufactured locally must be discouraged from importation. Akpa who is also the Chief Executive of SKG Pharmaceuticals while commending the government for including pharma products in the Executive Order for local patronage, said, but compliance is still very low and impact is minimal. He said other African countries such as Ethiopia have identified pharmaceutical manufacturing as strategic and the industry is being encouraged. He expressed optimism that his members will deliver through the government’s support. “We can achieve the target of meeting 70 per cent of Nigerian Drug needs through local production as stipulated in the National Drug Policy (2005 as amended) in record time if we get the expansion fund,” he concluded. Speaking earlier, Ohuabunwa said it is easier to import drugs than to produce, just as he noted that the input into local manufacturing is still low. Ohuabunwa said; “We can all agree that our country will fare better if we take control of drugs and medicines as it is done in civilized climes of the world. “The carefree attitudes with which drugs have been handled have resulted in the hydra headed monster of drugs and substance abuse, and we are struggling today to take control. He identified some of the reasons for the reduction in local production of drugs: “Policy reversals and inconsistency in government policies. There is also the issue of corruption and import duties that favour drug importers instead of producers. “Government preaches what it does not practice. They must patronize made in Nigeria drugs and use them. Besides policy inconsistency, there are also problems of poor infrastructure, lack of patronage for local products and uncontrolled market space. Reasoning that the country would gain tremendously by boosting local drug production, the PSN President also noted that the society plans to work with the Nigerian Institute for Pharmaceutical Research and Development (NIPRD) and seek for funds to boost research into local sourcing of APIs. The seasoned manufacturing pharmacist further announced that support for local manufacturing of pharmaceuticals and active ingredients tops his seven point agenda to improve health delivery in the country. He also said that PSN under his watch would collaborate with relevant agencies in achieving Pharmacovigilance. Pharmacovigilance is the concept of drug safety programmes which require strong links with the regulatory body to make sure those authorities are aware of the safety issues in daily practice. Regulators know that pharmacovigilance is a specialised area that plays a key role in the ongoing safety measures taken to protect medicinal products. Other agenda, according to Ohuabunwa include: Provision of framework towards improved health care outcome in our health facilities and country at large; ensuring the proper integration of pharmaceutical care in all aspects of pharmaceutical services in Nigeria. Also included in his agenda is facilitating the smooth take off of the National Drug Distribution Guidelines (NDDG); promoting equity and fair play, team work and proper remuneration of pharmacists in public and private sectors. The rest he said is to advocate for the passage of the Pharmacy bill, which will strengthen all aspects of pharmacy services; and ensure 100 per cent internship placement for new pharmacy graduates.